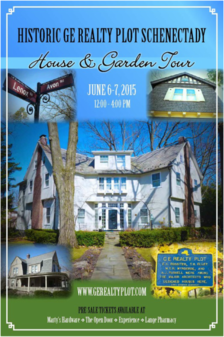 The GE Realty Plot Home & Garden Tour returns this year on Jun 6 and 7. Tickets are $25 and available at a handful of locations listed at that link. The tour has been offered sporadically in recent years -- the last one was 2013 -- but it sounds like the plan is to now offer it biennially. Just a reminder that the annual Hidden City House and Garden Tour in/near Albany's Center Square neighborhood is set for Thursday, June 25 from 5-8 pm. Tickets are $15 through June 19 and are available online. This home (which has a twin on Rugby Rd.) uses an interesting casual placement of its windows, purposefully designed to not line up with the dormers. This home presents a beautiful transitional design between the Queen Anne and the Colonial style with its dramatic descending gambrel roof, wrap around porch and beautiful Palladian window. This home takes full advantage of its corner lot placement with its symmetrical 'wing' structure commanding the space gracefully. From its second story 'skirting' to its Richardsonian red porch masonry, this home is a spectacular example of the Queen Anne style and Victorian treatments. This is the second house of three that William Ely built in the plot. This home can be viewed as Tudor Revival or Queen Anne, however the squareness of its shape and half-timbering move it more away from Victorian style. You can also buy tickets at the various houses (with the exception of Abbe Hall) on the days of the event.